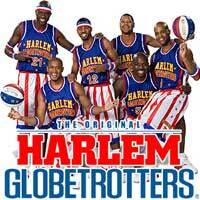 With their amazing athletic, acrobatic and clowning skills, the team of insanely talented men and women known as the Harlem Globetrotters is sort of like the greatest circus troupe you've ever seen -- but with way more slam dunks. And Hi-Lite, Too Tall, Scooter, Hoops and the others know how to do more than just shoot hoops -- they'll wow you with ball-handling wizardry, rim-rattling jams and four-pointers shot from 30 feet away, not to mention their clever comedy bits. The 'Trotters have been one of the best live shows around for more than 90 years and count Henry Kissinger, Whoopi Goldberg and Pope Francis as honorary members -- though you probably won't see that trio making any under-the-knee passes on this 2018 World Tour. But they are making a stop at the Allstate Arena and United Center to play their long-suffering foes ... and you're humming "Sweet Georgia Brown" right now, aren't you? At Allstate Arena on Dec 27. At United Center on Dec 28.